Are you brave enough to face the truth that one day somebody could easily clone (duplicate) your personalize blogger template? From few years, spammers have learned various things that duplicating BlogSpot a template is not difficult anymore because all you need is a bit familiarity with CSS, HTML and XML. The internet is jam-packed with those Blogger Templates that are clone from various Pro blogs hosted at Blogger. Copying or Replicating a personalized Design of a website is consider as a crime and the culprit may have to serve detention if he is guilty. In Blogger platform, the whole theme relies on a single XML file that allows spammers to clone templates without any hesitation whatsoever. Today we will discuss How to Prevent Blogger Template from Getting Cloned. Why To Protect Your Blogger Template From Duplicating? The most idiotic question any one could ask is that why I should defend my personal website template from copying. Every Webmasters admires his site design because he knew that no one else have the same theme. Having a unique theme for your site is something that represents a website’s BRAND. Moreover, it becomes the trademark of a website because the visitors start to resemble a site from its matchless design. Since, Blogger is not a robust platform. Therefore, the techniques through which we can prevent our template are pretty much on lesser side. Nevertheless, they are effective and once you will apply them to your site, spammers have to scratch their head to copy your theme. Following are the few unique techniques that will help you to prevent your template from copiers. The biggest drawback we have in Blogger Platform, it is not flexible. We cannot upload a separate CSS style sheet in blogger instead it let us attach our all CSS coding within the template, which allows others to copy the styling without facing any stress whatsoever. Therefore, it’s crucial for every Blogger user to paste his all style sheet coding in a separate File and then upload it on either FREE hosting or a Paid Hosting. Lastly, attach the uploaded CSS File to the Blogger template. Now people have to scratch their head in order to find the CSS file in the source code of your website. 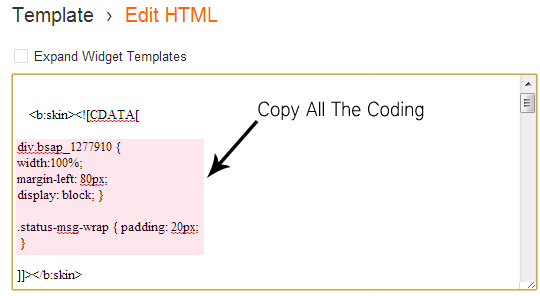 The Example Below shows you how and Where to insert the CSS Style Sheet in Blogger Template. Now Paste the copied code in an Empty notepad and renamed it to Style.css (.css is file extension). Then upload the Style.css to a Free or Paid hosting. Now Save your Template, and that's it. Try to keep your CSS Style sheet in jumbled form because if you will keep it in a systemic manner, then chances are extremely high that people can easily copy your theme. By making your CSS Coding mixed-up, you are forcing the copiers to work hard to get to your theme. To explain more clearly, Following is the comparison of a Jumbled (Mixed-up) and an ordinary coding. One of the most prominent ways to prevent your template from duplicators is to distribute them on several pieces. You can distribute you CSS on several sections and can follow the same steps as we have mentioned above to apply it in your Blogger template. In the same way, you can upload more CSS files whenever you want to add more functions to your website. Having multiple CSS files on a blog is a perfect way to fool the template cloners. The best way to protect your copyright work whether it is a piece of Coding, Pictures, Music there is only one place, Creative Commons. It enables you to protect your copyrighted work from copiers and etc. You can easily design your own license whether to allow your audience to edit or just read your piece of work. By applying for a Creative Common License, you are confirming that you own a certain product which could be anything. You can easily register a Free License on Creative Common by filling a sign up form. Once you have done with the registration, they will offer a Coding that you have to integrate into your blog. Congratulations, you have positively listed your website on Creative Common (All Right Revised). We hope these tips would help you in shielding your blogger template from spammers. However, after registering your site in Creative Common you will be one step ahead from template copiers. If we miss out any tip or techniques, then don’t hesitate you leave your comments. Till then, Peace, Blessings and Happy Protecting. I always wonder that how simple is it to copy some other template in blogger, But this post is amazing and clears my all doubt. Check :: Get" .IN " and " .COM " Domain For Free with 1year Free hosting . . I always use Mixed CSS codes in my Blog Template. can i use hosting service for blogger blogs? If i copy above code? Then can i delete all code after paste the link on above < head > TAG? Thanks you so much for reply syed faizan ali. But how can i host file for blogger? Can i host blogger? I think dividing your css in multiple files is not a good idea. it increase your http request which lead to slow down your site. so combine all your css in a single file. Agreed with your statement, HTTP requests will surely increased if you divided css files. If some one desperately wants your design, he will GET IT! I Can Give You About 1000s For Blogs that are using More the 1 CSS Files. Its True that it will Increase HTTP Request but think how many Scripts you usually use I Think Tons of Them. Using 2 to 3 Css Files is not a New Thing Many People are doing and that didn't cause to Much Damage to there site Speed. Is this really stop copying? A desperate blogger can copy even then now. nice idea, but... this's cant stop the cloner template. Do i have to buy a separate hosting for blogger if i want to buy a domain with .com etc? No You Don't have to buy a Separate hosting. Just a .com Domain would done the Trick. Peace. 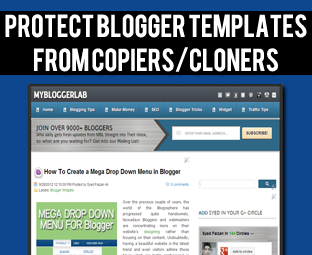 I just saw mybloggerlab clone blogger template. How they do that if you already knew how to prevent it? Before reading this blog i was asking people how to clone a website but now i am much relaxed by reading this blog so thank you for helping me.